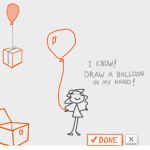 DrawAstickman.com: Start by drawing a stickman, then watch him come alive and duel, fly, and jump. As the story develops, you draw simple objects for him to use. This is a kick.